Long wheelbase BMY Harsco m928a2 6wd cargo truck with front winch. Truck is equipped with supper single tires, insulated steel hard top and painted green and black. Customer will be installing a log loader on chassis to be used in log home building business. Thanks for your business Phil! 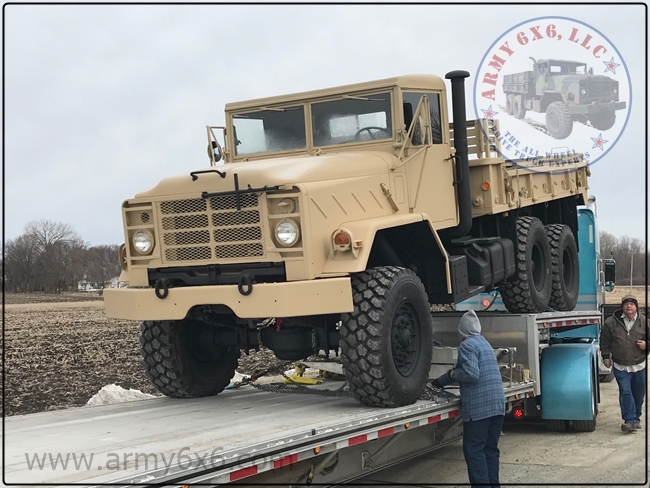 Upstate New York bound M931a2 6x6 semi tractor to be used for a construction project. Hard top, 12 volt trailer converter and block heater installed. Thanks for your business John! Repeat customer. Two more m923a2 6x6 chassis heading to Nevada for water tanker applications. Good year G177 dual tires, hard top, block heater and custom painted per customers specifications. Thanks again for your business! 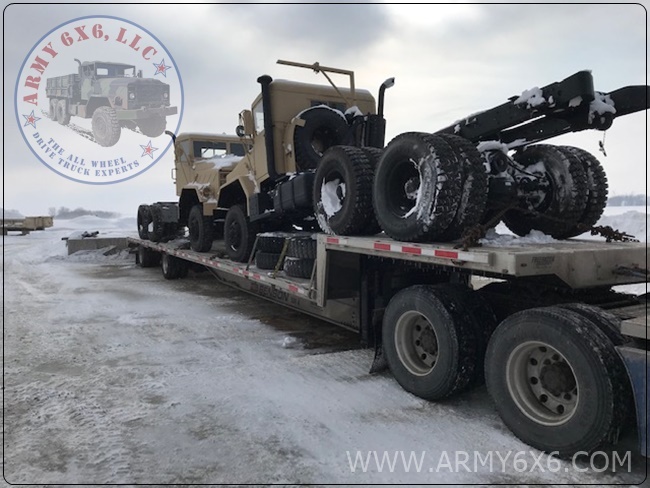 army6x6 M820 5 ton 6x6 headed to Western Nebraska to be used in drilling operation. Thanks for your business Travis! Repeat customer with over 20 of our 6x6 trucks. 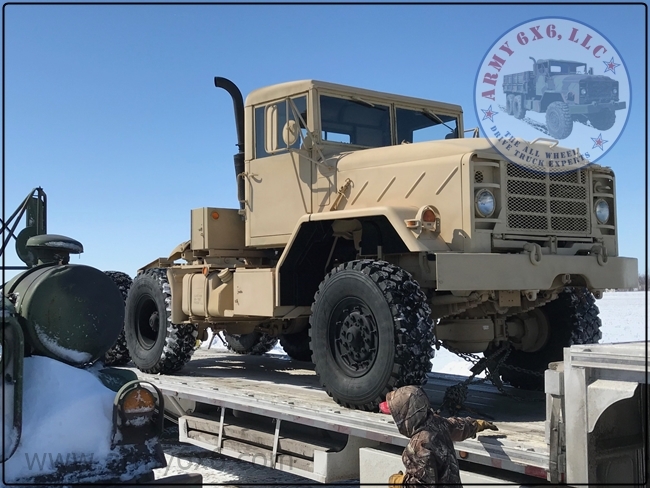 M923a2 6x6 cab and chassis heading to Nevada to be used for off-road water tanker application. Unit custom painted per customers request. Hardtop, block heater and 1100x20 Good Year g177 tires installed per customers needs. Thanks again for your business Jason and Martin! 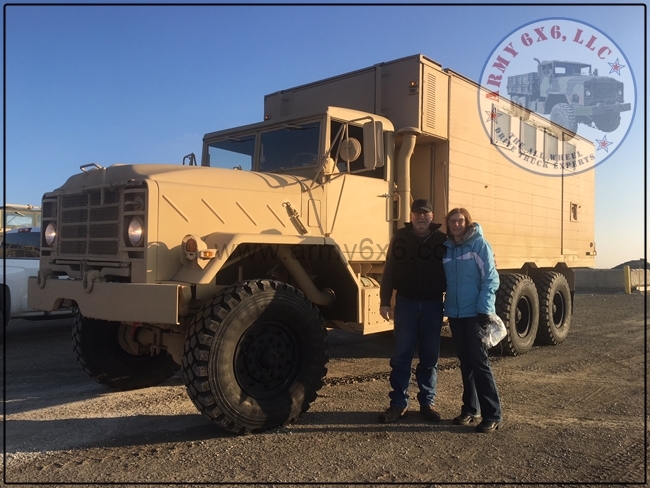 Repeat customer in Wyoming purchasing a BMY Harsco m923a2 6x6 cargo truck to be equipped with a water tanker. Unit equipped with block heater and insulated steel hard top. Thanks again for your business Frank! M934a1 expandable van heading to Indiana. Unit equipped with hard top, block heater and new 395/80r20 tires. Thanks again for your business Wendell and Marianne! Repeat customer. 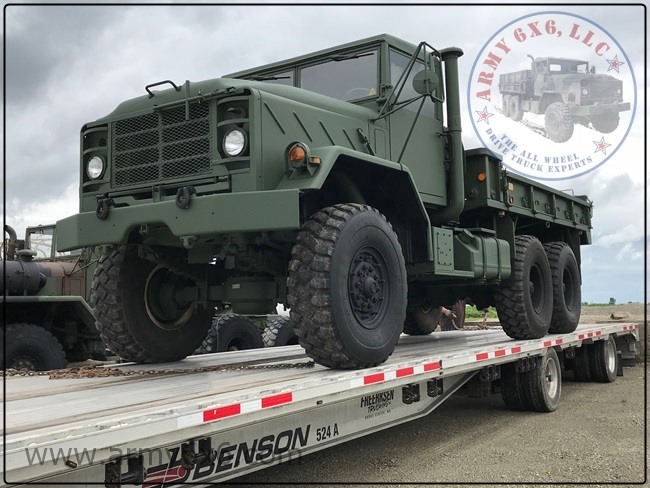 Rare M930a2 6x6 winch equipped dump truck heading to Michigan. Unit equipped with hard top per customers request. Thanks for your business Duane! Florida bound! Another long wheelbase heading out to repeat customer in Florida. 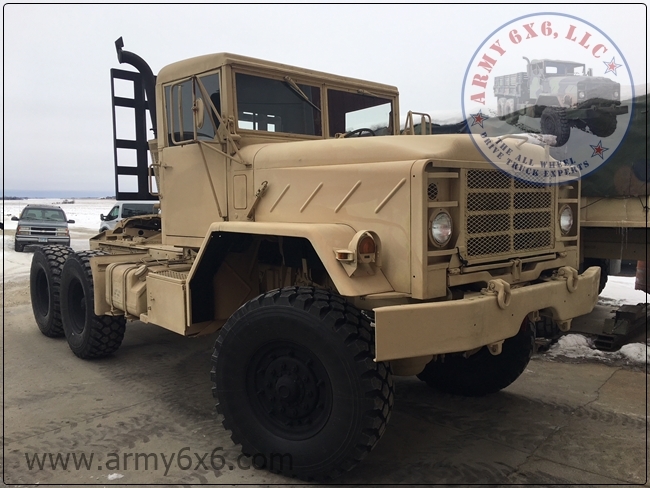 This M927 long wheelbase 6x6 will be used for agricultural use. Thanks again for your business! Repeat customer. Two Long wheelbase M927 cargo trucks equipped with Cummins diesel power and Allison automatics heading to Florida. 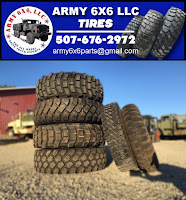 Trucks equipped with hard tops and 1100x20 tires. Units will be used for agricultural purposes. Thanks again for your business Aaron and Baker! M818 semi tractor heading to Montana for misc. farming duties. Unit equipped with hard top, new 395 super single tires, insulated steel hardtop and 12volt trailer convertor. Painted to customers specifications. Thanks again for your business Zade! 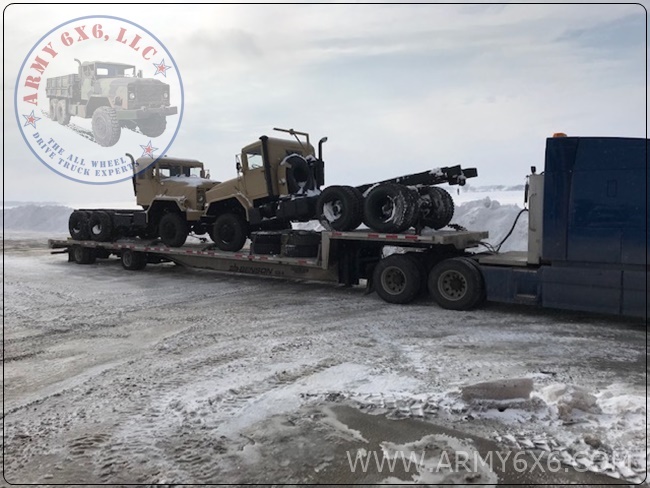 army6x6 Two m931a2 6x6 semi tractors heading to New Mexico to be used in a large trenching job. 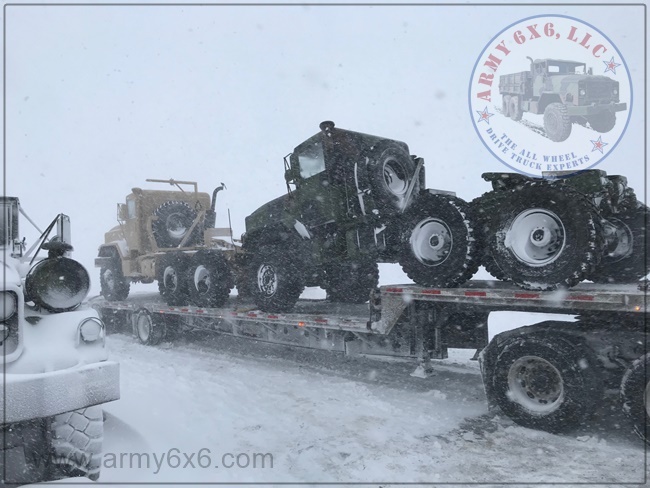 These are the third and fourth semi tractors Jon has purchased from Army 6x6 LLC over the last four years. Thanks again for your business Jon! M923a2 6x6 cargo truck headed to Iowa to be used by a repeat customer for a gluten processing plant. Unit was equipped with hard top, new 395 tires with extra spares and painted to their corporate colors. Thanks again for your business Jordan! Super clean m923a2 Cummins powered 5 ton cargo truck heading to Ohio for a construction project. Unit is equipped with steel insulated hard top and painted. Thanks again for your repeat business Jim! 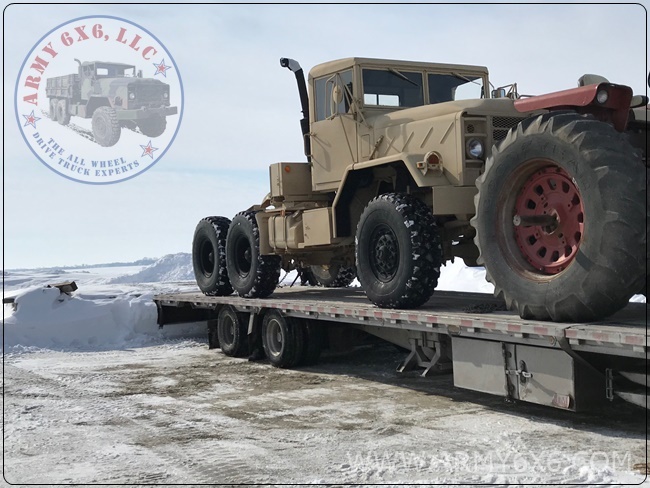 M942 long wheelbase 6x6 chassis heading to Illinois to be used for potato farming. Unit equipped with block heater, new 395/85r20 tires, hard top and painted white. Thanks again for your business Tom! M931a2 6x6 Cummins powered semi tractor heading to Palmer, Texas to be used on a large power line construction project. This is the third semi tractor for this particular job that has been purchased from us. Unit is equipped with steel hardtop and is ready to work. Thanks again for your repeat business Charlie. 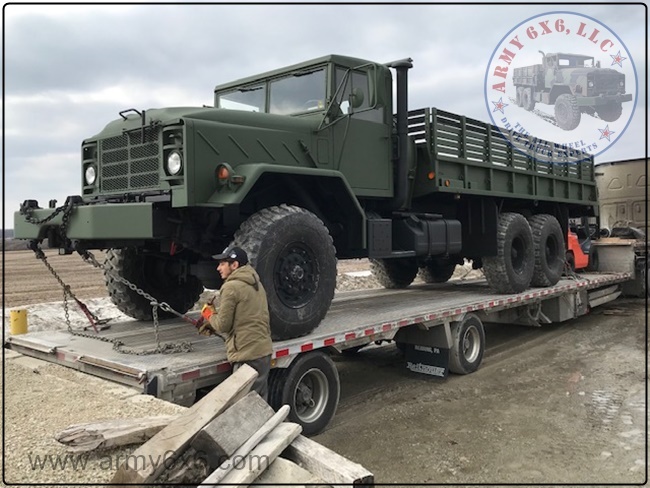 M923a2 6x6 cargo truck headed to Missouri to be used as a fun weekend cruiser. Unit was custom painted dark green and black. Insulated steel oem hardtop was installed, troop seats and new cargo cover were also included with order. Brand new Michelin 395/85r20 XZL tires installed. Thanks again for your business Jim! 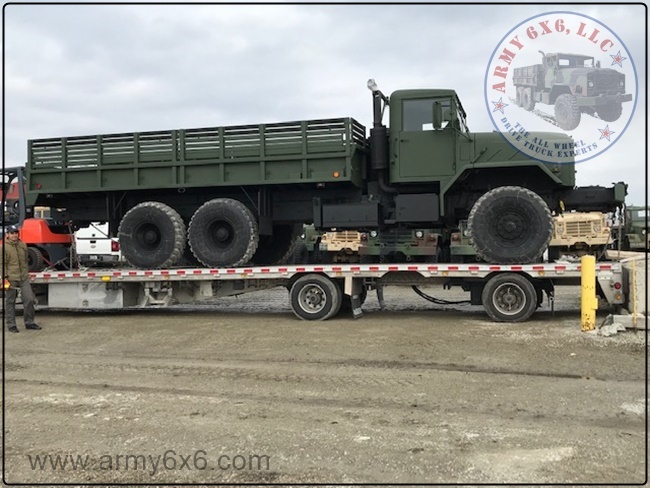 M923a2 6x6 military cargo truck heading to Kansas to be used for rural fire fighting. Unit equipped with insulated steel hard top, 12 volt alternator for accessories, painted red and new 395/80r20 Michelin XZL tires. Thanks again for your business Greg! Repeat customer purchasing M931a2 6x6 semi tractor heading to Ohio on a pipeline project. Unit equipped with insulated steel hardtop, brand new 395/85r20 Michelin XZL tires. Thanks again for your business Johnny! 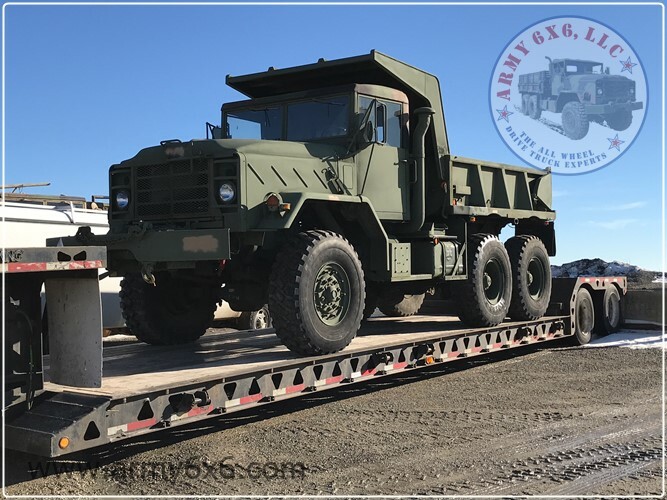 Super clean m923a2 military 6x6 cargo truck heading to Southern California. 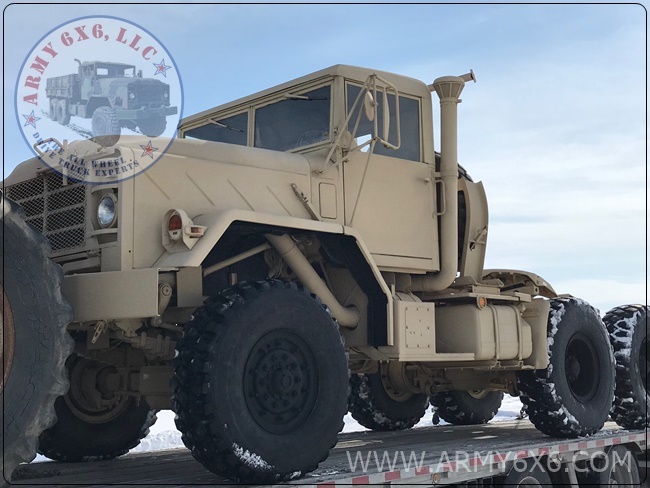 Truck outfitted with steel hardtop, new 395/85r20 Michelin XZL tires including multiple spares, troop seats and cargo cover with custom tan and black paint scheme. Thanks again for your business Ron! 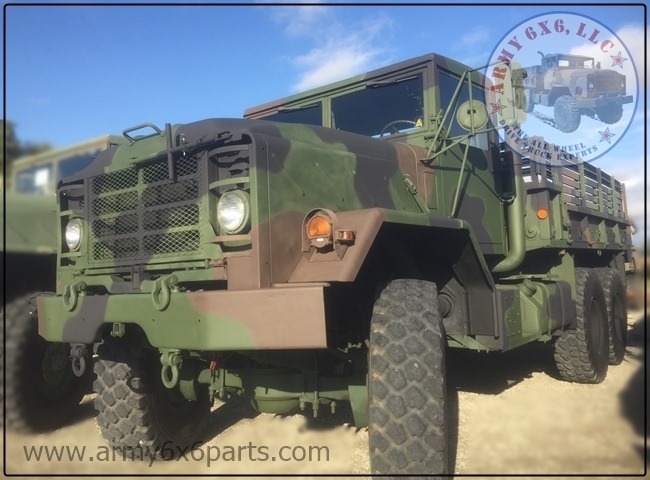 M923a2 military 6x6 cargo truck with 1100x20 dual tires, hard top, block heater and custom tan and black paint scheme. Twenty mounted spares included with truck. Unit will be used for a water truck to support a large drilling operation. Thanks again for your business Jason and Martin! 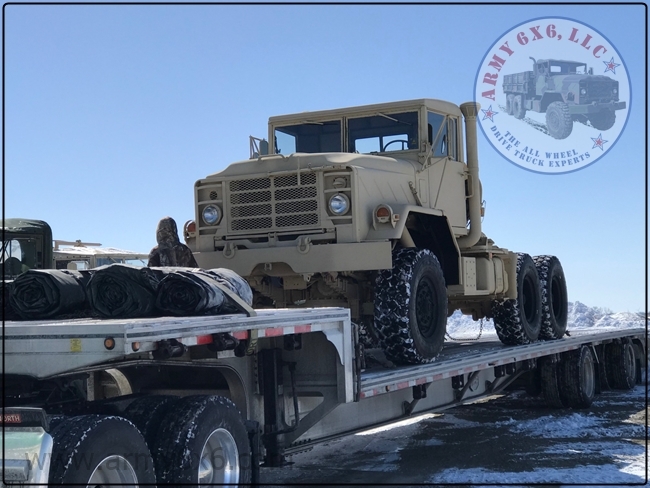 Repeat customer purchasing two additional m931a2 military 6x6 semi tractors headed to Texas to be used for a power line construction project. Trucks are equipped with steel insulated hard tops and were mechanically gone through. Thanks again for your business Charlie! 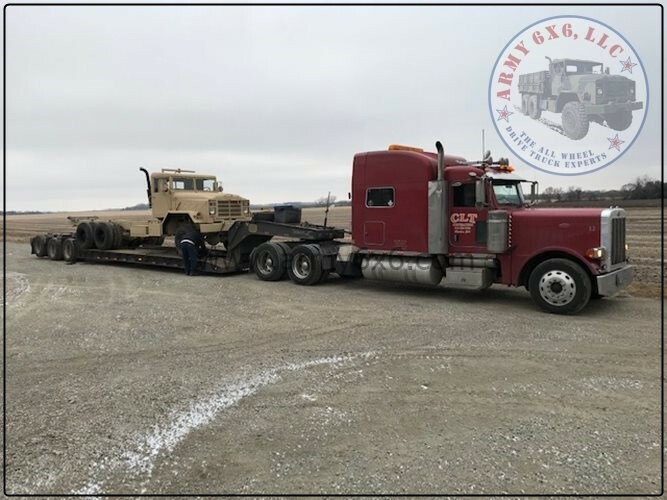 Repeat customer purchasing a M931a2 6wd semi tractor heading to Arkansas to be used for a set out truck for a logging operation. Truck equipped with hard top and 46” Michelin tires. Owners wife and daughter went to my alma mater Harding University- go Bison! Thanks again for your business Scott! 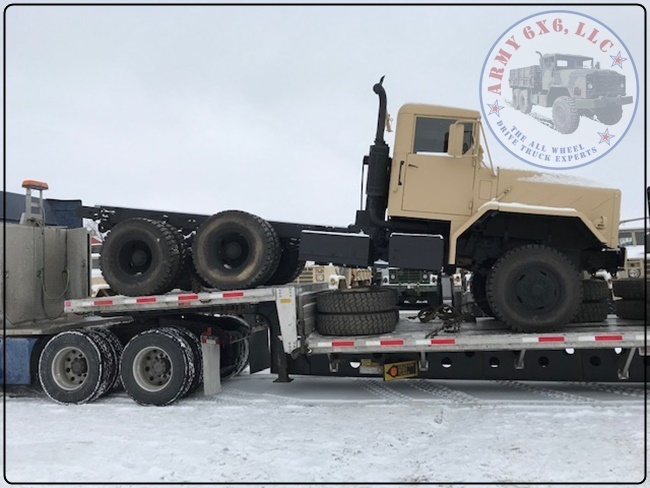 M931a2 6x6 semi tractor heading to Tennessee to be used for pulling a log bunk trailer for a large sawmill operation. Unit equipped with new Michelin 395/85r20 XZL tires including 3 mounted spares, steel cab guard, Insulated steel hard top and block heater. Thanks again for your business Ed! 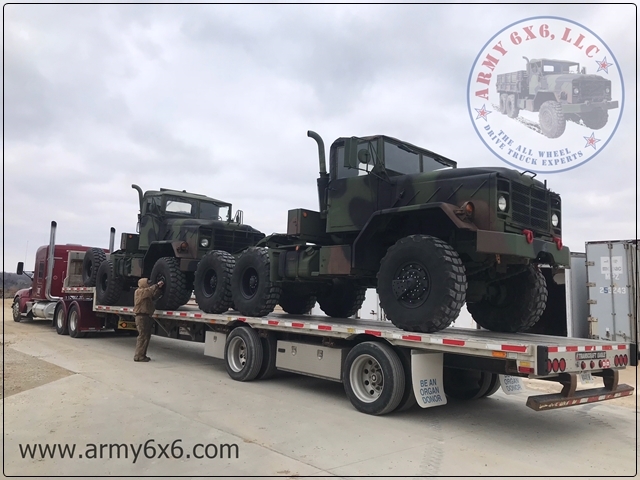 Two M931a2 6x6 semi tractors headed to Michigan to be outfitted with a few accessories and then off to Ohio to work on a large dam project. Thanks again for your business Ryan! 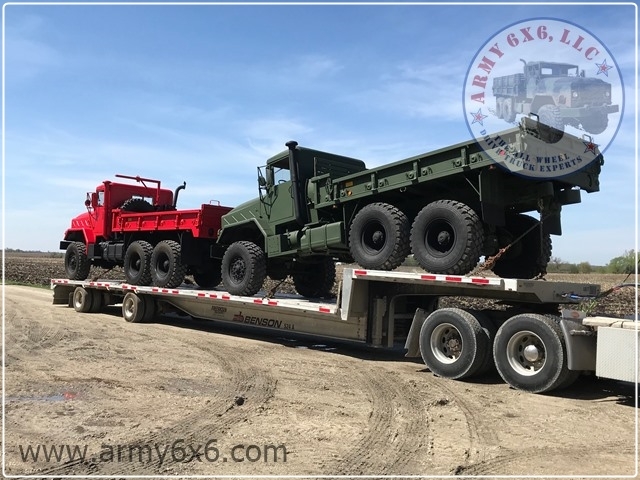 Two m923a2 6x6 cargo trucks heading out to Nevada to be used for water tanker end use. This order was for three units and 20 spare tires. Customer has purchased over 25 6x6 trucks from us over the years which are in use in multiple states. Units have beds removed, hard tops and block heaters installed, CTIS disabled and tires converted to 1100x20 duals. Units are painted tan and black per customers request. Thanks again for your business Jason and Martin! 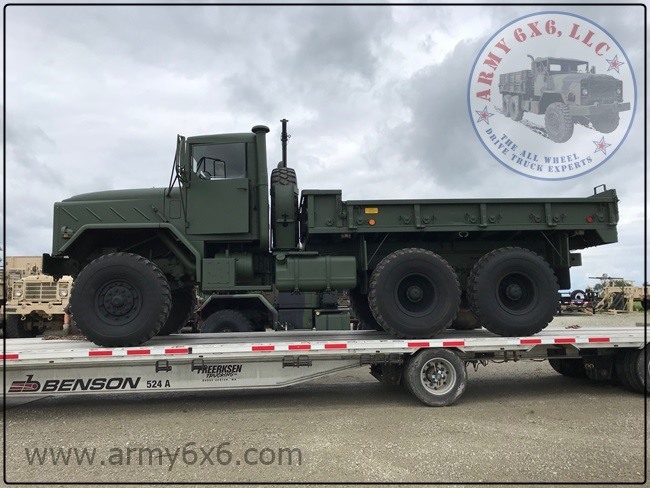 Super clean BMY Harsco M923a2 6x6 military cargo truck heading to Alberta Canada. Truck equipped with 14ft woodland camo cargo cover and block heater. Truck is being driven home by Gary and his friend that flew in and were picked up at the airport. Thanks again for your business Gary! Long wheelbase 6x6 chassis being shipped to Phoenix, Arizona. Unit was equipped with hard top, new 395/85r20 Michelin tires and painted white per customers needs. Unit will be up fitted with a large water tanker for construction job site work. Thanks again for your business Todd! 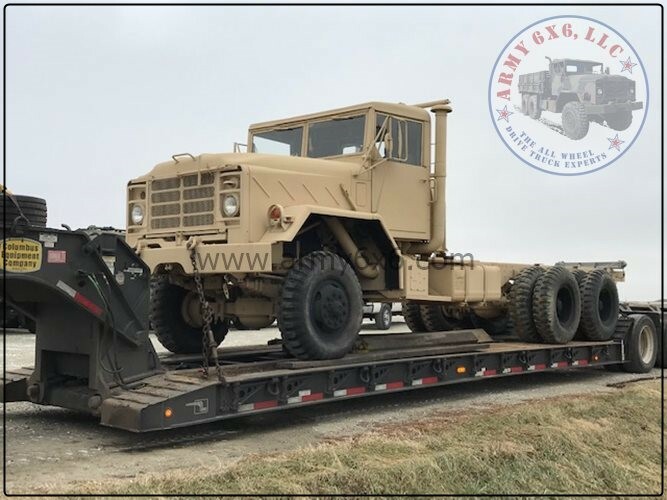 M923a1 heading to Kentucky to be used for petroleum exploration. 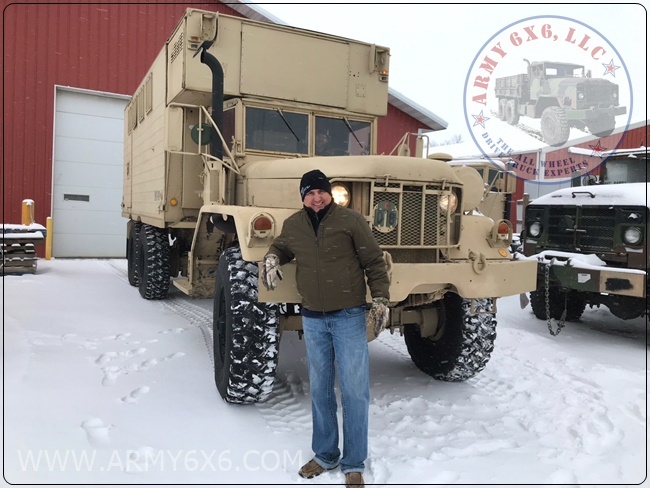 This is the second 6x6 truck purchased over the years from this customer from us. This particular truck was gone through mechanically and had a hard top and block heater installed. Go Univ of KY Cats! Thanks again for your business Chris! M923a1 truck number 3 shipping to the Montgomery Texas fire dept over the last two years. Kirk and Bryant flew up to Minnesota to inspect their truck and to receive operation and technician training with Jim and Adam. Thanks again for your service and business. M923a2 cargo truck heading to Livingston, Texas. Truck equipped with hard top. Thanks again for your business Cary! M931a2 6x6 semi tractor heading to south west Iowa to be used at a gluten processing plant. Truck has insulated steel hard top, block heater, brand new 395/85r20 tires installed and was custom painted to customers specifications. Thanks again for your business Jordan! 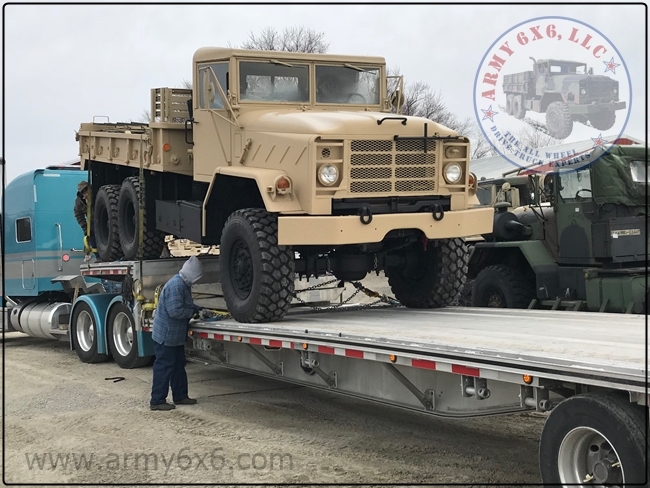 Army 6x6 LLC sold Montgomery County Emergency Services in Montgomery, Texas a M925 last year which was used to evacuate 100's of people during hurricane Harvey. The truck performed without a hiccup even driving through water that was hood height at times. They recently placed an order for a M923 to have on hand in addition to their M925. Unit is shipping with troop seats and brand new tarp and bows. Thanks again for your business Tim and the rest of your staff!